Together with the question “Tell me about yourself,” the question “Why are you applying for this position?” is asked in almost every single job interview, that’s why it needs to be answered in a clear and concise manner. In this article, we’re going to reveal the reason why employers ask this question, and the 2 steps in framing your response to catch the interviewer’s attention. Why do employers ask this question? Employers ask this question to know 3 things: how fit you are for the role, how well you know the company, and how you can reconcile both. This question also allows interviewers to get to know your passion for the job and the skills and competencies you posses relevant to the available role. Most interviewers also want to make sure you’ve done your research of the organisation and the role. Following on from that, employers will evaluate you on your career aspirations and future plans, your motivation (in case you are hired), and the most appealing aspect of the job and the company to you. What are the different variations of this question? How to structure your response to this question? To prepare for this question, you need to segment it into 2 aspects to enable you to formulate your response in a logical manner. 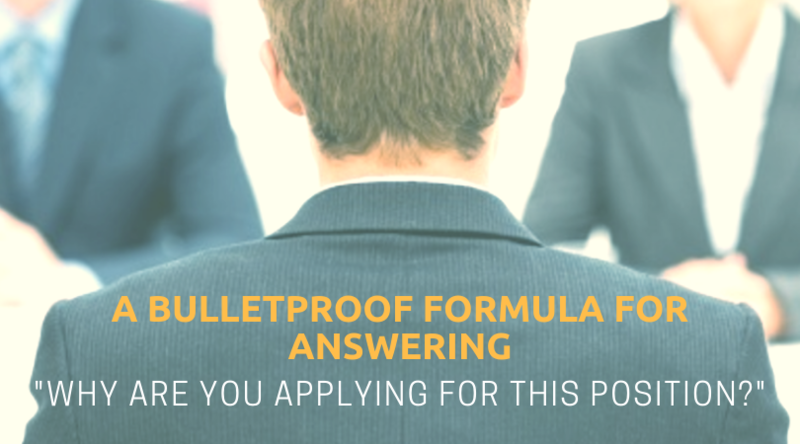 If answered skilfully, your response can increase the chance that the interviewer will see you as the right candidate, therefore raising your likelihood of being hired. As you’ve done your pre-interview research, have you come across aspects of the company values and goals that align with what you’re looking for? Can you say that what they represent aligns with what you represent? Once you start answering this question, you can in turn refine your answers down into easy to remember points. Focus your responses to include specifics. These include the organisation’s core values and reputation, growth or success, business model, target market, or your appreciation of the products/services it offers. Your response can also include non-position related things like the company’s social responsibility programs or anything that you find intriguing. Your first point of research is always the company’s website. Read about its history, mission statement, product lines, achievements and awards. You can also do a Google search to get to know the lest trending articles and news about the company. Lastly, use your most important source of research – your network. If you know someone who is working at the organisation or had worked there previously, get in touch with them. These ‘insiders’ can potentially help you obtain valuable information that are available elsewhere. Example of poor responses: Just so you know, “It’s close to where I live” is never a good answer. Don’t use generic answers too such as “It seems like this is a super cool company to work for and it would be great to be able to get a job here” as these show that you haven’t done much research about the company. Aside from your knowledge of the company, you also have to show the interviewers that you’re capable of actually doing the job. Focus you answers on the skills required, using your personal experience to demonstrate them. Employers are also after someone who will most likely add to the value of their organisation. If you can, use numbers to demonstrate how you can add value. For instance, you may have helped reduce cost, cut down cycle time or increase sales. It’s not best to mention the salary, working hours or commute times as the main motivation for you wanting the job. Focus on how your hire might benefit the company instead of how working for the company benefits you. Align these with your skills and experience and how you plan to use these to benefit the company. Click here for more job search tips and advice. For more ideas on how to craft winning resume, vist www.rev-upyourresume.com.au or connect with us through LinkedIn, Twitter, and Facebook. Visit: rev-upyourresume.com.au for more info or connect with us through LinkedIn and Twitter. With a laser sharp business focus, Rev-Up Your Resume delivers strategic resumes for clients to get them into the doors of top employers across the globe. Whether its to apply for a better job, a promotion, a new career, or a first job; to transition from private to public sector; or to rejoin the workforce after a lengthy hiatus, Rev-Up Your Resume is able to assist clients across numerous industries to find great jobs and advance their careers throughout their work life.